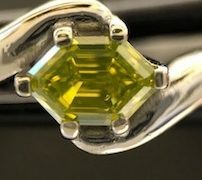 This 0.41 Carat Fancy Vivid Green Diamond is truly stunning. Carefully shaped into a Modified Octagonal Step cut, the cutter accentuates the rich pear-like green yellow hue that dominates the facets, with slivers of pale lemon yellow adorning the gems crown. A beautiful marriage of colors. This diamond also boasts the exceptional ‘Fancy Vivid’ color rating, the coveted top tier grade. This diamond also boasts a ‘Very Good’ polish rating, only steps away from a perfect rating. The swirling metal the jeweler chose to capture the diamond in is fantastic, and an art piece in of itself. Perfect for a growing collection, and to adorn a hand. Yellow diamonds are often the strongest sellers at the retail and auction levels, and frequently exceed auction price expectations. Unsurprisingly, rare yellows with a strong green color such as this ring are extremely uncommon. Unique pieces such as this rarely come up for offer, and when they do they rarely are available for long.